When last we saw Death Stranding, Mads Mikkelsen was using undead soldiers and creepy tentacles to scout the sewers of a war-torn city, where Guillermo Del Toro was hiding with a baby (which may or may not travel through time) kept in a jar. Yeah, it's weird. So when can we expect some clarity and maybe even a glimpse of gameplay? According to Del Toro, hopefully soon. Speaking to IGN, Del Toro revealed that even he hasn't seen much of the elusive, much-anticipated game. "In Death Stranding I'm just a puppet," he said. "I don't know what [Hideo Kojima]'s gonna make me do. He's supposedly going to show me the gameplay at some point in the next couple of weeks." 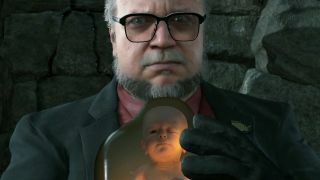 If Del Toro is calling himself a puppet and saying he hasn't yet seen gameplay, perhaps Death Stranding will be less of a collaboration between the Spanish filmmaker and Kojima than some thought. The pair previously worked together in shaping P.T., the playable teaser for the since-cancelled Silent Hills game, but it sounds like Kojima is definitely leading the way this time around. There are only a few weeks left in the year, but a couple of opportunities for Kojima to show off more before we switch over to 2018. There are The Game Awards, hosted by Geoff Keighley (who considers Kojima a friend, and during which we saw the game's second trailer), which will be held Thursday, December 7 at 5:30pm Pacific / 1:30am GMT. There's also the annual Sony-focused event, PlayStation Experience, which will begin on Saturday, December 9 at 10am Pacific / 6pm GMT. Hopefully we (and Del Toro) will know more by then.